Michael Jordan is now 48 years old. These days he's known for Nike's "Air Jordan" sneakers and for his Haynes underwear commercials, in which he plays the smiling, patient straight man to over-zealous admirers who wear the same underwear he does. And he's the majority owner of an NBA team, the Charlotte Bobcats. And oh yeah, he's the greatest basketball player who ever played the game. He is personally responsible for the Chicago Bulls's achieving two three-peats in the 1990s - six NBA championships. Professional basketball is a worldwide phenomenon now, and it started with Michael Jordan. For an example of his greatness, check this story. On EFFORT - "Success isn't something you chase. It's something you have to put forth the effort for constantly. Then maybe it'll come when you least expect it." On SELF-CONFIDENCE - "You have to expect things of yourself before you can do them." 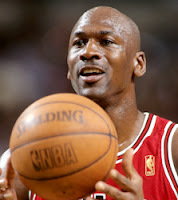 Love Michael Jordan's attributes and character traits as a basketball player. Like any human, though, he has had moral failures that disappointed me, particularly in his marriage. I'm human just like him; by God's grace, I hope to be faithful to my wife of (so far) 14 years. However, I've learned a lot from his other winning traits.